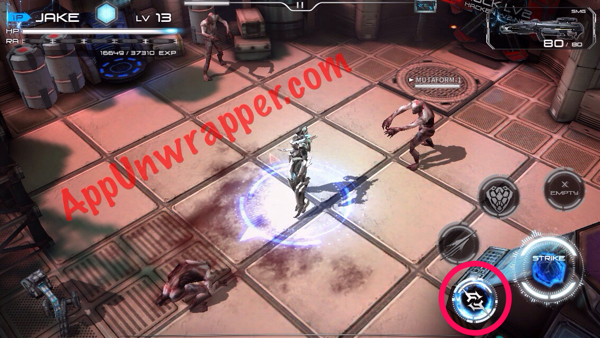 Implosion – Never Lose Hope by Rayark Inc is a premium hack-and-slash game for iOS devices. This is a walkthrough guide with hints, tips, tricks and help for the game. It’s a work in progress, so please bear with me. Feel free to ask for or offer help in the comments section. Let me know if you need help on a specific mission and I’ll do my best. See my Implosion review here. Note: I’m using pagination for this guide. Click on the little numbers at the bottom to jump to another page. You control your war mech with the left side of the screen via a joystick. Your main attack in this game is melee, your sword. Hit the STRIKE button to attack the Xada. The other buttons are evade/dodge and special abilities that you can use after you’ve charged them up by performing regular attacks. You’ll soon be given a gun for ranged attacks. Drag the STRIKE button to aim your gun. But ammo is limited, so you can’t always rely on it. Ammo does automatically recharge after a short wait. It is tempting in this game to just go head-on and mash the attack (strike) button. And you can actually get away with this early on in the game. But don’t ignore the Evade button. It makes you invulnerable for about a second, and even lets you go through enemies! I’ve been finding it particularly useful against large enemies (mini-bosses) that do lots of damage and have lots of HP. This is where you can equip new items you looted. Tap on one of the circles to see your inventory that can be equipped. Some have negative effects, so you need to take that into consideration. There are a lot of ways to play with your build here. 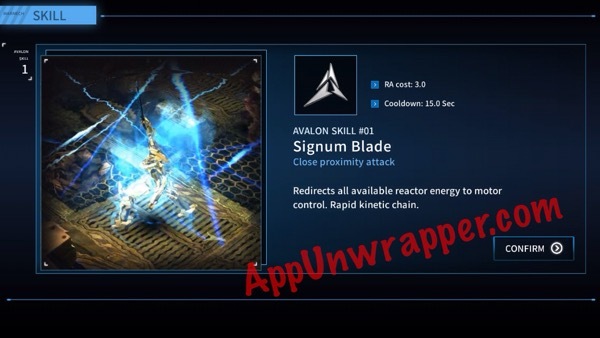 You can also use credits to buy items from the shop using the shop icon in the upper right corner. The central icon is what allows you to change your special abilities. You can tap the icons on the bottom to see a description of each ability. You earn badges by meeting certain conditions on a mission. You can see the badges several ways. From the map, tap on the little badge icons. To earn a badge in Hard mode, tap on the blue circle on the map to switch from Easy to Hard. It will turn red. 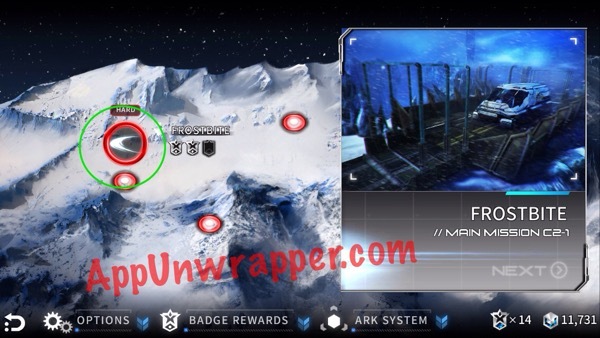 On the bottom strip, to the left of the Ark System, you can see the Badge Rewards. These are rewards you can collect once you’ve earned a certain number of badges. Sometimes you have to choose between several different rewards — so choose wisely! Tip: If you’re having trouble earning a specific badge, come back to it later after you’ve leveled up and/or got better equipment. It will be much easier to achieve those goals when you’re stronger. You’ll encounter some locked doors on certain missions. They usually say a Hack level on them. This means you need to equip an item that gives you some Hack stats in order to open that door. They usually look like an open padlock and are named Cerberus Algorithm. If you know there are no locked doors on a mission, you might want to swap out that equipment for something more useful. 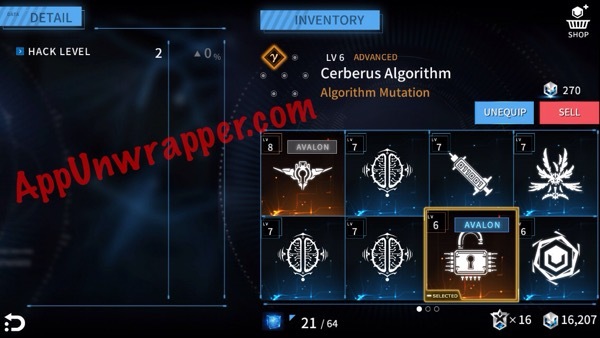 Just don’t forget to re-equip the Cerberus Algorithm when you need it! You can only access the iCloud after you complete the first mission on the device. That’s when the options menu is available. 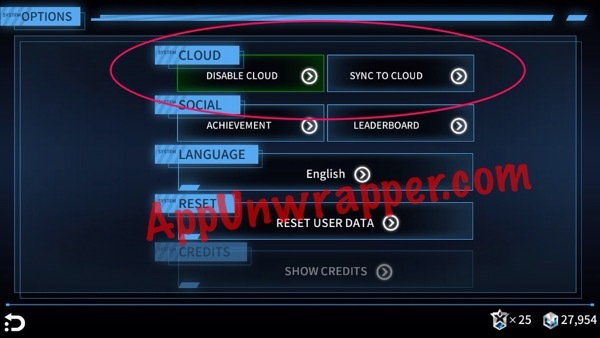 If you delete the game and reinstall it, you’ll have to play through that first mission again before you can access the cloud. Small inconvenience, but after that it’s been working great for me. Just make sure to close down the game on the device you’re not playing on so there’s no conflict. But every time you switch devices, it should ask you if you want to use the local or the cloud save. Note: I’m not sure if it works the same if you have only one device and delete the game. Can anyone confirm? You can earn infinite guns with badges. But there’s a catch — you can’t earn more badges when one is equipped. They’re mostly for farming and fun. Once you complete the campaign, you can start the game over on Expert mode. You can also earn badges here, and they add to your overall badges from the regular campaign. So I suggest working on getting some from there if you’re having trouble getting them all in the regular campaign. There are no revives in Expert mode, so you may need to level up a bit for it. 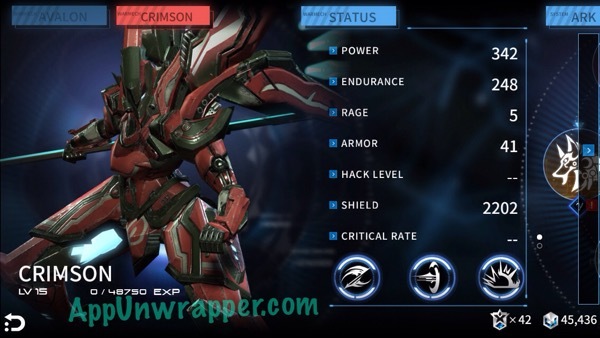 For those asking, these are my current builds for Avalon (level 17) and Crimson (level 20). I don’t know if they’re the best builds. Feel free to offer your own advice on the best equipment and stats to use. Click on the little number 2 below to continue to Chapter 1. Thanks! I’m still playing through the game (C4-2 is giving me trouble so will likely have to grind a bit) but I do want to expand on the guide. 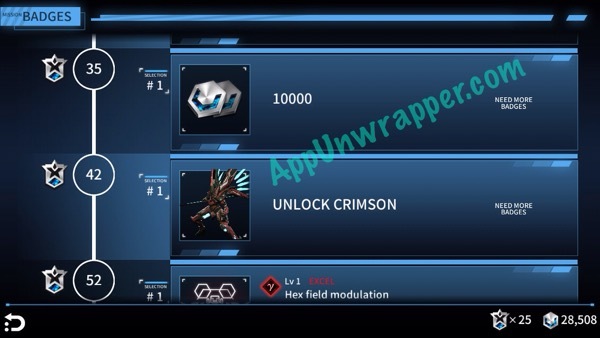 So, got lvl 20 and unlocked Crimson and she was still lvl 15. So it seems that 15 is default. Good to know! You’re probably intended to unlock her before Avalon hits 15, so it’s seen as a bit of a bonus? Any idea if there’s a level cap? If there is, I’m guessing it’s around level 30? Great job! This was really helpful, even if it’s not complete yet. Juuuuust curious but how LONG did it take you to get Crimson?? And do you HAVE to spend badges or does she just unlock at a certain time in the game?? You have to unlock her with badges. I don’t remember how long it took me to get her. But I think I was in Chapter 3 already. Do you know how long the trail version last?? Or does buying it just give you sweet stuff?? I don’t know if mine is best, but I can share which ones I’ve been using. Give me a bit to get the stats down. Thanks, please give an Ark setting in SS. I posted photos of my stats. Let me know if you need more. Thanks for the guide. I was going nuts trying to figure out how to get the hacker. I figured it was an ark ability but I’m only level 5 so far. Just found it peculiar one of the earliest badges says open the secret room and I can only assume it’s the giant locked door haha. Well written guide and even better with the pics! May be a stupid question but how do I jump over objects I can’t get around? You can’t. You have to go around. If it’s truly blocking you, it might just not be a path. Played it through normal, am now on expert, and the blocked path that reads “no access” in ch.1 lvl 5 Fatality March is still blocked off. Anybody figured out yet how to gain access here? By hacking the two doors you can reach the destination point right away, without risking yourself with the traps you’d otherwise face on the way. Just equip the Lv.3 hacker ARK you get from badge award. However you will have to deal with all the mid-sized bosses (5-6 of them!) in the same room so you better be prepared. Has anyone figured out what these are? There seems to be no in game explanation. Rage – Is this pertaining to non powered hit combos? But it has to be separate from Normal Arc Damage. Heavy Attack Damage – Is this pertaining to powered hits with the purple circle? 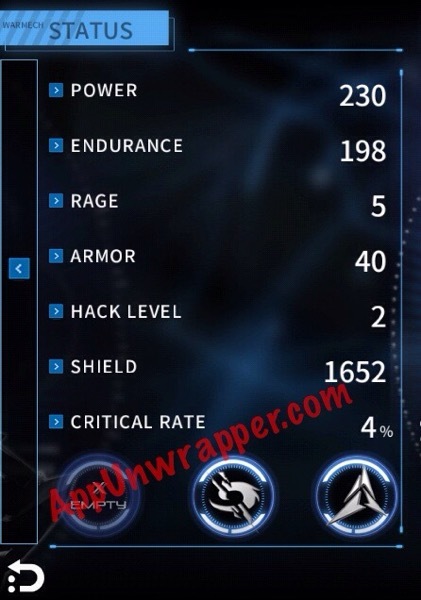 Agility % – Does this reduce recharge time of evade? Also I can’t seem to find sound options in the game. Guess I wont be listening to a podcast while playing this game. Never mind, it seems all the higher lever ark stuff are obtained in expert mode. Also, I didn’t think you can get excellent items if you had infinite weapons equipped, but you can. Red boxes are more difficult to get though but I really want my warmechs to have lv 30 equipment. I doubt that blocked path leads to anything. Has anyone found a red(excellent) occulomotor enhancement, theta wave, extra sensory perception? 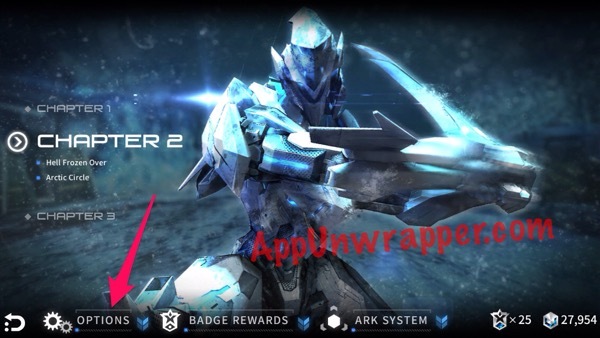 Also, any lvl 30 center ARKs? 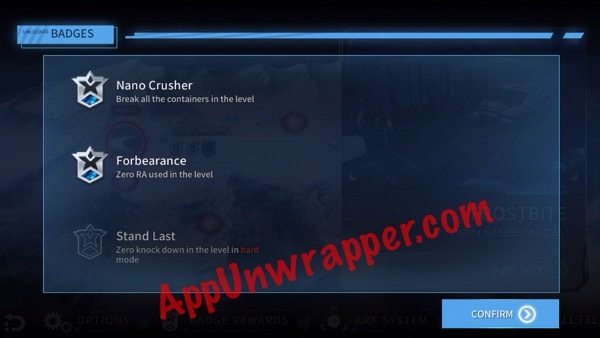 The only excellent lv 30 ark fragment that I found was a Thor factor. 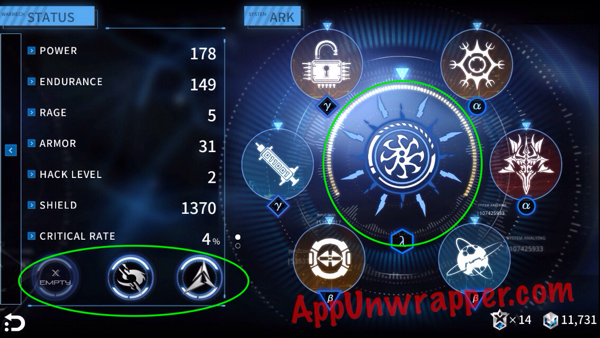 High lv ark fragments can be found in expert mode. Tell me if they are hard to get cuz I’m unlucky or something. 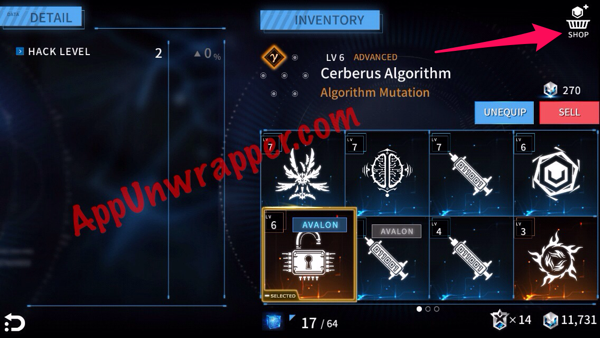 Currently I have been running C4-2 Melting Steel (Expert) with Avalon with all item find ARKs. And an infinite rocket launcher. The 3 purple dudes at the end have a high drop rate. I have found several level 30 red ARKs for the 3 outside categories. The highest center ARK I have found is level 22. I’m going to try that and see if I find some stuff. I always like to see those shiny red boxes. Are you using iphone or android tripolic x? Max item find i have found btw is 128. I’m using android version. I didn’t have much luck getting much of anything on the level you told me. I did find higher drop rates on other stages. Yeah, my max item drop rate is at 128%. I wonder if excellent versions exist. Arayark was not kind enough to give us an item list or something. Extra Sensory Perception and Theta Wave Activity. Trying to pass later expert stages without my infinite xada destroyer is incredibly difficult. I would like a higher drop rate like in hard mode. Lv 30 red boxes could make things a bit more enjoyable. 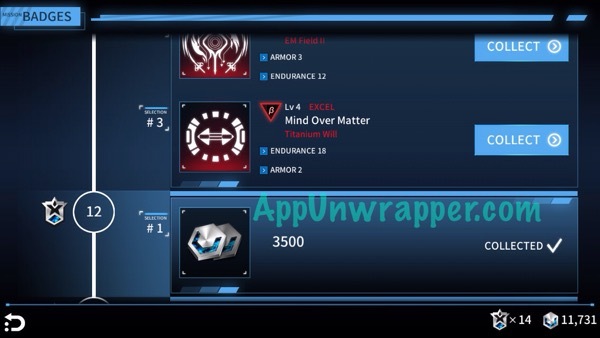 I completed expert using Avalon with 2 occulomotor enhancements (28% ballistics each) 2 zero-point energy shields (521 shield each) and 5% agility arks… Forgot the name. While using an infinite rocket launcher, the reason being that it has knockback as well as area of effect damage. What I haven’t been able to find… Yet. Are any red(at any level) theta wave or occulomotor enhancements. They are shown in the promotional footage in the app store. I want the red versions of the item finders. I’m starting to think that they don’t exist in game. I haven’t found them in game yet, but I am curious if they only drop on lower levels? Confirmed. This is how i leveled to 30. Although I used infinite rocket launcher. Leveling up is easy in the game. I found more lv 30 red boxes but on a different level, melting steel to be exact. I played the game more on expert to see if there was a pattern. It seems that one level on each stage has higher drop rate than the others. I’m not sure if most of you noticed that on some levels, enemies drop absolutely nothing. However, on just one level on that stage, enemies seem to drop something every time. Those are the stages I’ve been hunting for red boxes. I was so excited that I found a rare red lambda unit, the large center slot, but alas it was lv 22. Why!!!??? It did have nice stats but my favorite shield breaking ability was absent. I found a weaker advance version earlier. Found a second level 24 red lambda ARK today. I have 1 for Avalon and 1 for Crimson. I’m steadily getting the lv 30 red arks i need but no item finders or ballistics yet. 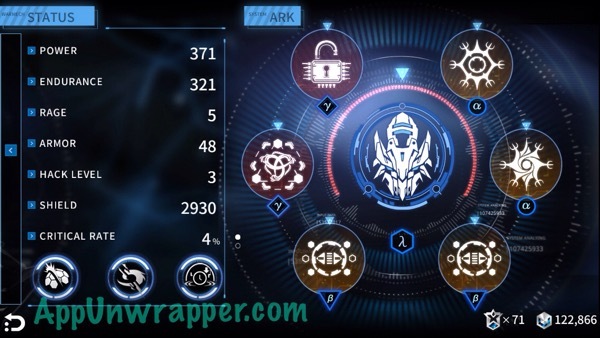 The thing that annoys me most is the low level arks you get on expert mode. Post your finds if anyone gets something significant. 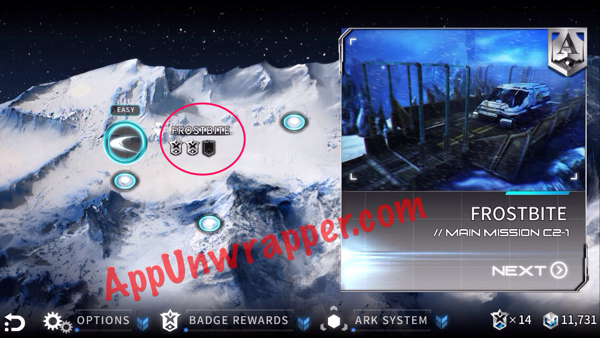 Go hunt for rates on Melting steel level on stage 4. Wow! When I have time, I need to get back to doing some farming! Some of us enjoy this game a lot! A few are trying to uncover any of its secrets. I played the level Melting steel alot. Those 3 big purple robots drop the best stuff. I used infinite launcher to breeze by the level. Its odd that we didnt get lv 30’s right away. Thye might be rare drops. It’s time for an update to the game right? Maybe Guantlet can make a cameo with some hidden levels. I hope there is a sequel to this game with more stages and tons of rare stuff.